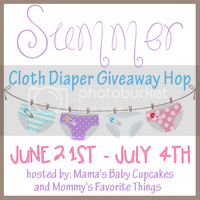 This is the 5th annual Summer Cloth Diaper Giveaway Hop!!! This giveaway is going to be prizes with the theme CLOTH DIAPER. Anything from cloth diapers to cloth wipes to cloth friendly clothing is acceptable for this giveaway hop. There are lots of options for finding a prize for this wonderful event. Your only mission is to find the perfect prize pack for your blog! Because this is a blog hop, each blog will be responsible for securing their own prize on their own blog. Each prize must be a Minimum of $25. The Prize can be sponsored OR you can self sponsor. Each blog can have more than 1 winner, but each winner must win at least $25 in prizes. Joining this Blog Hop is FREE as long as you share the announcement in some way. It takes 2 seconds to do this!! Tweet, pin, or share on FB.